The Trinity in the New Testament — Are there 7, 8 or 10 “I AM” Statements in John? Becoming complete – Understanding, once we are his, God leads us with rod and staff to bring us to be complete obedient servants. Godly Obedient Servants – Knowing to mature as believers, we will learn to give up our own ways and one day decide to listen to God and obey his leading. Watching/Serving – Understanding, as faithful servants, we are to watch for the Lord’s promised return while persevering in service bringing fruit to the kingdom. Final Things/Judgment – Knowing every person will be judged and either cross over to eternal life or be condemned to death. Every list in the Bible, every number and every book, chapter and verse reveal the progressive themes of this ten part plan of redemption. 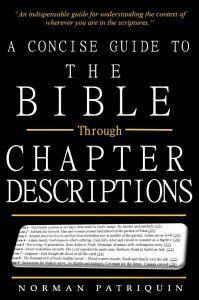 These ten parts become a template that can be seen in every aspect of the structure and text of the Bible. Examples of text matching this template can be seen in; the themes of the first ten books; themes in the first ten chapters; themes in the first ten Bible verses; the Ten Commandments; the meanings of names of the ten generations from Adam to Noah; ten parts of the Lord’s Prayer; and all other parts of the Bible. The ten “I Am” statements of John are compelling evidence revealing how the Bible is written in a progressive and perfect patterns of tens. 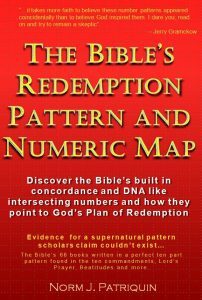 In addition to helping demonstrate the Redemption Pattern, realizing the pattern association to the text gives insight to interpreting the claims Jesus makes about himself. The pattern also reveals each of the ten statements are in a progressive order that take us through God’s plan of salvation and remind us of the different steps of learning we will experience in our walk with God. Additionally, by understanding the themes of numbers associated with each “I am” statement, and comparing them to the text, we can validate our understanding of the text. That is, the pattern helps us discern our interpretation for correctness and helps insure we do not confuse or miss some intended meaning. In the case of these “I Am” declarations, the pattern tells us our traditional teaching of 6, 7 or 8 declarations is incomplete. They effectively warn us to double-check our interpretation because the meaning of the text does not seem to match themes of numbers associated with it. These two verses fit between the 1st and 2nd on the typical list of 7 “I Am” statements, but are always omitted as separate and distinct descriptions because they are seen as elaborations of the overall description of Jesus being “the Bread of Life”. They are not seen to stand on their own, but when the template of the Redemption Pattern is lined up with the full set 10 “I Am” statements, it becomes clear that we must study all ten to understand what Jesus said about himself. I discovered this oversight in teaching because, over my years in study of the patterns, I have come to realize there is nothing written in scripture that does not follow this ten part template – so wherever I find a list in the Bible I check my understanding of it against the pattern. When I did this with the “I Am” statements, the list of seven did not fit the themes of the pattern – that is, the text of each of the items 1-7 did not fit with the themes typically associated with the parts of the pattern. When I investigated further, I realized why the list of seven was not the complete teaching (not all lists have ten items but every list follows the progression of the numbers. For example, lists of six items will each match the themes for numbers 1-6). Jesus intended to differentiate himself with each of the three “Bread of Life” declarations and combining them into one causes us to overlook his what he was claiming. In three different descriptions about Jesus being the “bread of Life” he is describing himself as each of the distinct parts of the Trinity; 1) He is God, the Bread of Life; 2) He is Jesus, the Bread that Came down from heaven; 3) and He is the Holy Spirit, the “living” bread that came down from heaven. When our interpretation is guided by the Redemption Pattern, the ten “I Am” statements make perfect sense and is wonderful confirmation that Jesus is declaring to us he is all aspects of the three parts of the Trinity. What an awesome message! Also excluded from the typical list of 7 “I Am” statements is John 8:18 which declares Jesus is the one that testifies about himself. It is the 5th statement which matches the 5th step of the Redemption Pattern. Also, when all these three verses of declaration are added back into the list, the complete list of ten items now match the ten parts of the Redemption Pattern. Where they once did not fit, they now properly line up with the Redemption Pattern themes – the 4th item describing Jesus as “the light of the World” matches pattern item #4 about creation and the earth; the 5th item matches the theme of Jesus instructing and revealing himself to us; the 6th item matches the theme of sin and redemption because Jesus is the propitiation for our sins; and the 7th item matches the theme of our becoming sanctified or complete through the guidance of the Good Shepherd; the same for the 8th-10th items. All ten declarations now match the progressive themes of the Redemption Pattern. The complete list now cross-checks with the pattern template thus validating our interpretation is likely correct. In the chart below I show each of the ten “I am” verses and provide a possible interpretation based on the guidance provided through the template of the Redemption Pattern. As you examine the list, consider who Jesus says he is; the meaning as related to this step God’s plan of redemption; and how the message in the text fits the Redemption Pattern, thus validating our understanding of God’s Word. #3 John 6:51 “I am the living bread that came down out of heaven…” RP#3- Holy Spirit – God’s spirit in us who; speaks to us; knows all about us; and has many other powers he uses in his work. #5 John 8:18 “I am He who testifies about Myself…” RP#5- Statutes/Covenants/Promises – Jesus, through his Holy Spirit testifies that he is the Son of God, savior of the World. #5 includes themes about learning of God’s laws and instructions to us. #6 John 10:7 “I am the door of the sheep..” RP#6- Sin, confession, redemption – Jesus is the only way to the Kingdom of God. Like the 6th book of Joshua where Israel crosses over into the promised land – for us to enter the land we must; see and confess our sin; repent of it; ask Jesus to be our savior and sacrifice for sin; and then set out to remove strongholds of sin in our lives. #7 John 10:14 “I am the good shepherd…” RP#7- The Good Shepherd – Jesus is God who guides us to being complete through both the rod of discipline as well as the staff of grace and guidance. We mature into Godly obedient servants and become complete/sanctified through this leading. #8 John 11:25 “I am the resurrection and the life..” RP#8- The Godly – #8 is a number of resurrection and of new beginnings; a number of baptism; circumcism; the receiving of the Holy Spirit which is a sign of our resurrection; and also speaks of the remnant of eight Godly ones that were saved from the great flood (Genesis chapter 8). #8 speaks of the eternal life offered to all who accept Jesus. #9 John 14:6 “I am the way, and the truth, and the life…” RP#9- Watching for Jesus return – #9 is about the future and more specifically, about us watching and persevering in service until the Lord returns and takes his people to heaven. He is the only way we can enter heaven. 10 John 15:1 “I am the true vine, and My Father is the vinedresser. “ RP#10- Final/Last things – The 10th and last Redemption Pattern number is about last or final things. It not only relates to last things and end times, but also is found associated to commands and final judgments. I sometimes think of #10 being related to final things declared – such that there is nothing else to be said. This verse may also be declaring that he is the vine to eternal life and that God is the one that gives life. Note: that I do not consider myself a Bible scholar, so I do not want to imply that what I have written here is fact or that I claim to be qualified to interpret scripture to others. Instead, these writings represent ideas I have come up with based on my understanding of the Redemption Pattern and Numeric Map. As always, search the scriptures on your own so you may develop your own opinion. Even if you don’t agree with my conclusions about the “I Am” statements, I hope you see the relationship of the pattern in the themes of each of the statements to that of God’s ten part plan of redemption. This explanation of the ten “I am” statements of Jesus hopefully show how the Redemption Pattern and Numeric Map not only validate the perfection of the Bible, but also are an invaluable tool for helping more accurately interpret scripture.